Not a MBBA member? No problem. You are welcome if you are an innkeeper or industry vendor in North America or beyond. a member of PAII or AIHP, you will not be charged the guest fee. 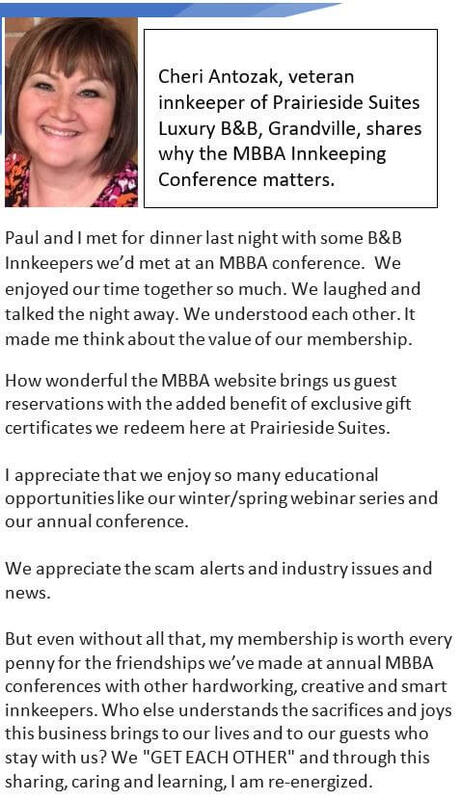 If you don’t meet that criteria but join MBBA by 01/01/19, you will be refunded the guest fee. and future innkeepers whether certain it’s the right match or simply exploring options. Click here to reserve lodging at exclusive discount rates. Conference rates are available any night, October 27 – 30. $107 per room night plus taxes includes full breakfast.